Anybody out there from Monsey who can possibly confirm this, or give more details of what happened? If you know anything more about this, I'd be curious to hear some details..
INN now has more details about what happened. The rav who did this was Rav Avraham Zvi Wosner, av beis din of Satmar in Monsey and grandson of Rav Wosner from Bnei Braq. He based his actions on his grandfathers psak from the "Asifa" last week that internet is completely assur and kids should be thrown out of schools, shidduchim should be disqualified and the like. Especially interesting about this is that after Rav Wosner's psak at the Asifa, he toned it down in Israel and a pashkevil was put out in his name with less stringent rules about use of Internet. An article yesterday explained after speaking to a grandson that what he had said at the Asifa was really his opinion, and he spoke live to avoid being told what to say, while askanim pressured him to tone it down after the fact and they came out with a different set of guidelines as published on the pashkevil in Bnei Braq. (It turns out that Rav Wosner was more machmir for the people of America than he was for the people of Bnei Braq). It seems his grandson did not accept the retraction and clarification and prefers to follow the original psak, as per hsi understanding that that is really what his grandfather holds. A recent divorce in Israel was settled based on the spouse's Facebook activity. Ynetnews is reporting on a divorce case in the Rabbanut in which 6 months after marriage the wife discovered that he was corresponding with women on dating sites and on Facebook to the extent that she insisted on a divorce. After arguing back and forth with nasty accusations going each way, the wife's attorney brought out the Facebook straw. the straw that broke the camels back. The attorney pulled out correspondence the husband had been having with women on Facebook and these other sites proving his infidelity. The rabbinical court saw that and accepted it as proof and admission on his part. They ruled that he had been caught with his pants down and ordered him to pay her damages to the tune of 150,000 NIS. I imagine the correspondence must have included not just flirting or inappropriate chat, but must have discussed details of an actual physical relationship. I don't believe that just flirting would be enough to justify the rabbinical court decision. Facebook is not private. If there is something you don't want the world to know about, or even just one person, don't put it on Facebook! this is the picture of the chuppa at a recent wedding among the extremist "kat ha'shalim" (veiled ladies' cult). The current trend among them and some other extremist people is to have a mechitza under the chuppa. When the groom needs to place the ring on his bride's finger, she sticks her finger through the cloth partition. We are a coalition of 94 MKs, this is the time to lead a diplomatic process. But if it isn't possible to reach a permanent agreement with the Palestinians, we must consider an interim arrangement or even a unilateral move. We are on borrowed time. We will reach a wall, and we'll pay the price. People who are now in a coma will then ask how we didn't see this coming. Many have assumed that Barak's statement of a unilateral move means he is talking about possibly a Disengagement from the West Bank. Because he did not actually say that, another possibility might be that he is considering annexing the West Bank unilaterally. Why did the Israelis steal hummus from the Arabs? In religious ocmmunities in Israel, one can find in the local directory a multitude of free services offered under the category "Gmach". There is a gmach for almost anything you might ever need in a pinch, or as a one-time need. One of those gmachs, one I was always surprised to see, is a medicine gmach. Somebody starts a medicine gmach storing unused medicines, often prescriptions that were filled but not taken or remaining medicine after the recommended dose was used. The gmach will usually be accessed when no pharmacy is available, such as late at night or on Shabbat. Someone gets sick, so you go get your medicine and then after Shabbos you go to a doctor, get a prescription, fill it and replace the medicine. Sometimes it might include selling medicines that are very expensive and not included in the "basket of subsidized medicines" at discounted prices. I never really understood how someone could run one of these medicine gmachs. There is so much liability. If someone should overdose or have an allergic reaction, or a bad side-effect, it is a lawsuit waiting to happen. Besides for the fact that it must be illegal to distribute medicines like this, without prescriptions, by someone unlicensed. Anyway, the news is reporting that the police today raided the house of someone in Rechasim who was operating a medicine gmach. They suspect that he was collecting scripts and filling them at the pharmacy, after which he would distribute to people who needed medicines. As well, he would collect unused medicines from sick people. The investigation began after a complaint to the Ministry of Health. I don't know why this fellow was singled out - it doesn't say that medicine that he distributed caused someone to get sick or some other harm.. Either way, I have not heard of this happening before, and these medicine gmachs have been around for a long time. It was long overdue that someone would complain and force the authorities to step in. Will we soon see the end of the medicine gmach? Mark Zuckerberg, the founder of Facebook who is a newlywed (to a non-Jew) and suddenly worth about $20 billion, is catching a lot of flak today. 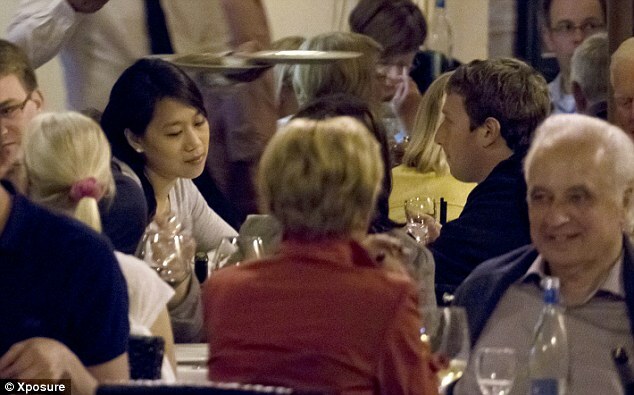 The newly married Zuckerberg couple are honeymooning in Europe. They have been publicized by a couple of different waiters around Europe for having sat in the restaurant and enjoyed a good meal, yet did not leave a tip for the waiters or waitresses who served them. This happened in at least two restaurants (from which it was made public by the waiter), one of them being a kosher restaurant in the Jewish Quarter of Rome. Zuckerberg is a jerk. Everybody "knows" that. That is his reputation and it is supposedly well-deserved. That is probably how he made Facebook so successful (not including the recent IPO). Personally I was more surprised to discover that he bothered to eat in a kosher restaurant than to hear that he did not leave a tip. What has been revealed here is a very big problem in Israeli society. There are human rights organizations that if we would allow them today to take planes and buses and do a 'transfer' of Haredim and Settlers, they would be the first to put them onto the buses. But with the migrants they suddenly come and have to talk, as they are funded by organizations that give them salaries, and that is how they justify their existence. To put Miri Regev in Nazi uniform, that is disgusting, they don't think they are doing anything to Miri Regev an israeli citizen. These hypocrites, whom I would lock them all up for their incitement against Jews, I want to tell you, this si the number one solution - to jail all these "human rights" people. I would send them to the place where we are now building refugee camps that they should work there..
As of right now, I have only seen two responses to the new arrangement by which the State will pay the salaries of non-Orthodox Rabbis appointed as community leaders. Minister of Science Rav Daniel Hershkowitz (Bayit Yehudi - Mafdal) said that he would explain the gravity of the matter to PM Netanyahu. Hershkowiz said that such a decision is not in the hands of the Attorney General or in the hands of any legal advisers or state officials. They can't decide who qualifies for the title of Rabbi. Minister of Religious Affairs Yaakov Margi (Shas) has said that in no way will he pay the salaries of Reform Rabbis. if he will be forced to, he will resign. The real solution might be for the State to not pay any rabbis and community leaders. Let that remain in the private realm. It does not seem feasible, as religious services might be at risk of not being provided in places where people want it for their lifecycle events but are not willing to shell out to pay a decent salary. I just don't see how the State can continue paying for the Orthodox rabbis and avoid paying the non-Orthodox rabbis, which is what the religious parties will want to continue happening. A new decision by the Attorney General is seemingly a landmark decision in how the State will now relate to non-Orthodox rabbis. Really though it is only the first step in what is going to really become the landmark decision. In 2005 a petition to the Supreme Court led to the Supreme Court ordering out of court negotiations to work out the issues of funding community rabbis, or leaders, who are non-Orthodox, specifically, but not limited to, Reform Rabbis and even more specifically female Rabbis. It has taken 7 years of negotiating and being sent back to the Supreme Court in between, but the State has finally announced what it will be doing. The State announced, via Attorney General Yehuda Weinstein that it has decided that local municipalities could employ non-Orthodox community Rabbis, and the funding would come from the State. I am not quite sure what that means. I get that now the State will pay the salaries of these community Rabbis rather than forcing it to be funded by the community privately, but I don't see how these rabbis will not be able to affect religious law. Are they official rabbis or not? if the State is recognizing them as official rabbis, I am not sure how these rabbis will be prevented form influencing law. This itself though is a major change from the status quo, for lack of a better word, but I see it as just a step to what is inevitable and will really be the major change in Israeli society. I have not seen a statement or reaction yet from the haredi politicians and askanim, but I am sure they don't like it. I don't know what they can do about it, but they should really be preparing to figure out how to deal with what this is going to lead to. In a state like Israel, with an active Supreme Court and a very liberal attempt to bringing equality to the public sphere, I see it as inevitable that eventually, unless something major changes along the way, the State will, no matter how begrudgingly, have to recognize the non-Orthodox as legitimate streams in Judaism and will have to give them equal standing with the orthodox. Whether we like it or not. I have basically stopped commenting on the tzedaka organizations' various fundraising campaigns finding every remote segulah ever mentioned in the most remote seforim that have been out of print for hundreds of years and promoting them to get people to give money, and then the antics of where they will send a team of tzaddikim to daven for 40 days or whatnot. After a while the same complaints over and over again get kind of stale. But now, one of the organizations has done something so unique, something I have never seen or heard of before, it deserves a mention. I saw in one of the haredi papers regarding the segulah of saying the prayer written by the Shloh HaKodesh on erev Rosh Chodesh Sivan that one tzedaka organization came up with a unique idea. They collected money for the segulah like everyone else, promising to send a team of expert prayers to the grave of the Shloh (in Tiberias) and they would daven on your behalf in exchange for your donation of x shekels. The next part is amazing. They went ahead and constructed a model of the grave of the Shloh, along with avreichim standing beside it wrapped in tallis and davening. I imagine it was all constructed from cardboard. They then put these models in some central places around town; the entrance to major shuls, around the shopping areas, and the like. I imagine the idea was to raise awareness to their Shloh campaign, rather than to actually suggest that someone could daven at the fake grave of the Shloh. But still. come on. Really? Madonna is back in Israel. She came a few days ago to spend the Shavuot holiday receiving the Torah in the Holy Land, and now she is preparing for her upcoming concert on Thursday, kicking off her world tour. I am no big fan of Madonna. I have not even listened to her music in maybe 18 or 20 or so years, and know none of her songs from these years. Though I did know some of her songs from her, and my, younger days, and I did followed her antics as she was a cutting edge performer always doing something crazy. Despite my not being much of a fan, I do appreciate how she supports Israel, comes here, gives Israel a big boost as a premier spot, all when plenty of other headline performers choose to ban Israel at worst and ignore Israel at best. And her antics, especially with the kabala studies, are eyebrow-raising and curious. Madonna spent much of the first days of her trip with her family visiting sites and graves in Safed (Tzfat) and Tiberias. I don't know if she dipped in the Ari's Mikveh, but she was planning to go to the Ari's grave. Some have been planning to protest her arrival and her kabbalistic pursuits. According to Bechadrei, Rav Gavriel Hubara of the Yemenite community in Tzfat is upset, saying that she only visits these areas as a gimmick to attract attention around herself, and not for any true reason. This upsets the local religious and haredi communities. Rabbi Hubara also complains that she insults her own study of kabbala by going to certain rabbonim for her research. Clearly a dig into and complaint about the Kabbalah Center and Rabbi Berg. Others complained that she turns the kivrei tzadikim into something trendy.. Knowing they can't really do anything about it to prevent her from visiting, they will make do with a simple protest. Plenty of people busy themselves with making visiting kivrei tzadikim "trendy", so this is nothing really new, and is really beneficial, even in a backhanded way. Maybe some Jews who might be otherwise unconnected or unaffiliated will find some connection. I am not planning on defending Madonna, as there is a certain abrasiveness I feel when I hear of her involved in the Kabbalah and visiting the graves, but I don't see it as such a big deal. When they draw 500,000 people to Meron and Kever Rashbi on Lag B'Omer including criminals, politicians and celebrities all for public appearances sake (though how are we to really know what their true intentions are), or Rabbi Nachman's grave in Uman for the holidays, or the grave of the Rebbe of Shtefnesht before elections or whatever other place or kabbalist they go to, I don't see this as much of anything unique or problematic that needs to be singled out. Here is a young man who had his entire future completely open before him. He had the ability to choose whatever path he would want for his future. the best schools were after him, but he chose to go to a school that would allow him to pursue both his academic advancement as well as work on his faith. And he is originally from Chicago. Mendel Friedman’s academic prowess could have landed him at any Ivy League college of his choice. But this “gifted prodigy” — as one of his teachers describes him — chose a small, religious school in Queens to hone both his academics and his faith. the 20-year-old chose the Lander College for Men in Kew Gardens Hills because of its promise for individual attention and focus on Judaic studies. He recently finished among the top ranks in one of the most competitive undergraduate math contests in the nation. “I like to develop a lot of areas which I think help me as a thinker and a problem solver,” said Friedman, who is set to graduate in January after 2 1/2 years of undergraduate study. Friedman recently found out he finished 22nd out of some 4,4000 contenders in the William Lowell Putnam competition, a prestigious national math contest. It was the highest ranking of any contestant from a New York college. Friedman said he always had an appetite for knowledge. He taught himself basic calculus by the end of elementary school, and more recently learned Russian on his own so he could enjoy works by Leo Tolstoy and Anton Chekhov. He also speaks fluent French, Hebrew and Yiddish. The Chicago native, who now lives in a dorm just off campus, credits his discipline, particularly in math, to his devout Jewish faith. Lander has an enrollment of about 300 students and is a division of Touro College. Dean Moshe Sokol said it seeks students like Friedman who are able to invest time in both academic and Orthodox Jewish studies. Friedman said he believes the two are related. “They both stem from a very deep passion of mine,” he said. That passion, said his teacher Oleg Friedman (no relation), was clear from their first class together. When he would give lectures geared toward Mendel’s level, “I lost the whole rest of the class,” he said. He and mathematics chair Moshe Snow took Mendel under their wings and gave him independent research to do in the fields of functional mathematics and quantum mechanics. “I do have friends, too,” he joked. “You can’t always be caught up in academia,” he added. You have to admire someone like that. There are things more important, and he was strong enough to give up a lot in order to pursue what he felt is more important..
Israeli chess master Boris Gelfand is in the middle of competing for the world championship of chess against the Indian chess master. Here is a cool clip from a couple years ago from when Netanyahu met Gelfand and started with a double challenge chess match - Gelfand was going to play against Netanyahu and against Natan Sharansky at the same time. Netanyahu bowed out and decided to be a backseat driver for Sharansky's match against Gelfand..
looks like this was premature. Intel decided to open in Ireland instead of in Israel..
1. What's The Deal With These Protesters? 2. JPost's List of 50 Most Influential Jews, Mostly Trivial - I disagree. While there were some that seemed surprising and not deserving of being on the list, and definitely not as high as they ranked, just because one disagrees with many of the people on th elist does not make those people any less influential. Somebody on Facebook posted the following video and it has gone viral. The video is of someone throwing an egg at a Sudanese fellow (or maybe Eritrean or South Sudanese or whatever other African countries these migrants and refugees come from) and they laugh. The video is a despicable display of racism. We may not want them here, we may want to send them back to their home countries or wherever else that might have the ability to take them in, but that does not give anybody the right to treat them in such a demeaning way. Basic human rights, basic humanity, demands that we treat each person with respect. He has done nothing wrong and does not deserve to be treated like that. I am an oleh, almost 2 years, from America. I love America; perhaps only because I was raised there. And though I love Israel too, I find myself ‘out of sorts’ in the Israeli culture. There are parts of Israeli culture that I embrace wholeheartedly; they mostly revolve around food J; like chamin shipudia, and mimuna. And it’s deeply satisfying to organically feel connected to the geography and history of the land and my people. But then there are the elements of the culture that disturb me, and I find myself comparing Israel to what I know, to my frame of reference, the U.S.
As shocking as it is to hear this level of degradation, which is always done with a smile and a joke, not because it’s funny but because deep down they know it’s wrong; as shocking as it is, the legal discrimination, the de jure segregation is the root problem; and the key to the solution. In the U.S, after the Civil War ended and black slaves were made free, a number of southern states passed laws that blacks could not ride in railcars with whites. They argued that: freedom doesn’t mean integration it means equality. Therefore, if you give blacks their own railcars to ride, and you give whites their own railcars to ride, everyone is free and equal. This concept of separate but equal was upheld in the Supreme Court ruling Plessy v. Ferguson. And for the next 40 years or so, separate but equal was law of the land, which meant: separate water fountains, separate swimming pools, separate schools, separate living, separate separate separate. Till one day a little girl name Rita May Brown wanted to attend the local school instead of having to walk a couple of miles over some railroad tracks to her dilapidated underfunded black kids school. That case was called Brown v Board of Ed. (Topeka Kansas). And the Supreme Court overturned Plessy V. Ferguson and said, ‘y’know what, we’ve seen 40 years of separate but equal and we see that separate but equal is not equal. Although hatred and racism in fact (de facto) exists in the real world, we cannot have any segregation by law in our laws, no de jure segregation.’ Therefore, because segregated systems and equality cannot co-exist, public life must be integrated. And today the U.S. has an African-American President. Right now Israel has both de facto and de jure segregation. Segregating Arabs, coercive religious practices in law, separate public school systems, and separate public transportation and on and on and on. The hope for Israel is that this is the beginning, that we are at Plessy v Ferguson and will one day get to Brown V. Board of Ed. The hope for Israel is that we are a young developing country and that the people will recognize that democracy is more than just one-person one vote, but the second leg of democracy is protection of equal rights. As long as we have segregation on our books, we have no equal rights, and are not a fully democratic country. The hope is we grow into democracy. Dan Goldmeier: Lives in Hod-HaSharon and is a Writer, Teacher, and Entrepreneur. 1. they are going to blame it on the jews. 3. Shouldn't Beryl be going to Florida in the winter? When synagogue attendance is lagging, as is the case on holiday evenings or prior to the Sabbath, more IDF soldiers are injured and killed.... The more Jews that learn Torah, the stronger our military will be. Just as there is an Air Force and a navy, there must also be a God Force. After the terrible tragedy of a family lost in a car accident, I kept seeing different announcements of what the "cause" of the tragedy was. I decided to make a list to keep track of the possibilities. these are the ones I have seen (in no particular order)..
Chief Rabbi Yona Metzger just sent out an announcement, a kol koreh, saying that we all must make a cheshbon hanefesh and see what needs to be fixed. He specifically adds that we neeed to deal better with the situation of parsha sheets in shul. People read them during davening. Gabbaim should only put them out at the end of the tefillah. Mynet has a piece on a lady in Jerusalem who started offering a service to any girl who want to lengthen her skirt, to be more tznuah, that she would do this for her. She keeps a database of seamstresses available in different areas, and takes care to ensure that any girl interested will be able to get her skirt lengthened. The woman created this service after she found herself recuperating in the hospital from a terrible illness by which she says she nearly died. She then committed that if she would recover she would start such a gmach. This is a wonderful thing she does for girls by offering this service. I have seen such services offered before, but they were always localized. A specific seamstress was offering to lengthen hems. This woman is making it into more of a project. But that is not what interests me. The story is not all that unique. Rav Kanievsky supports her initiative and said that women and girls who lengthen their skirts will be able to see blessings, by which in merit of those blessings they will find their proper zivvug - soulmate. She did not need a psak for this, she just wanted his support and blessing. I am always amazed that people who are doing a good thing need to go ask a rabbi first. if it was something morally questionable, I could understand. But when doing something that has no bad side to it, what's the question? We are now going to see a new segulah develop. Any girl looking for a shidduch is going to start lengthening her skirts as a segulah to finding her match. What if a married woman wants to lengthen her skirt, be more tznuah? What bracha will she receive from this, and what outcome will result because of it? 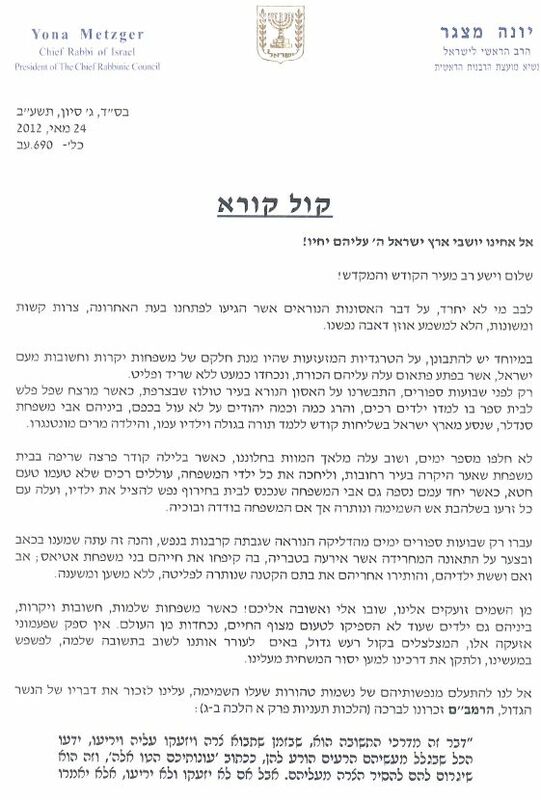 Just like many MKs, or potential MKs, have recently been announcing their plans regarding the "draft the haredim" issue, there is actually also a Haredi plan regarding the drafting of haredim. This plan though is not new. Yesterday, Minister of Interior Eli Yishai said that any haredi who does not meet the criteria of "torato umanuto" should be drafted. MK Moshe Gafni has said pretty much the same thing a number of times over the years. It is that simple. The Haredi plan for the issue of "draft the haredim" that is big in the news right now is: We want yeshiva boys to stay in yeshiva and learn torah. As long as they do, they should continue to receive their deferment from army service. Once they stop learning, want to leave yeshiva, they should be drafted into the army. The problem I have with that plan is that the rosh yeshivas are not sending the boys who do not learn to the army. They encourage the boys to stay in yeshiva despite the fact that they aren't really learning seriously. As long as the yeshivot don't play along with the army but encourage the boys to evade service, how is the army ever to know which boys are learning and which are not? Furthermore, whenever the government sends inspectors, generally to inspect regarding financial issues, but for other reasons as well, the yeshivot throw a fit, and the MKs are pressured to step in and try to get the inspections canceled or mitigated in some way. So the MKs say that if the boy is not learning he should be drafted, but they don't let the government inspect the yeshivot to see who is not learning, and the rosh yeshivot have no reason to turn in, or to to encourage those not learning to report to the army. 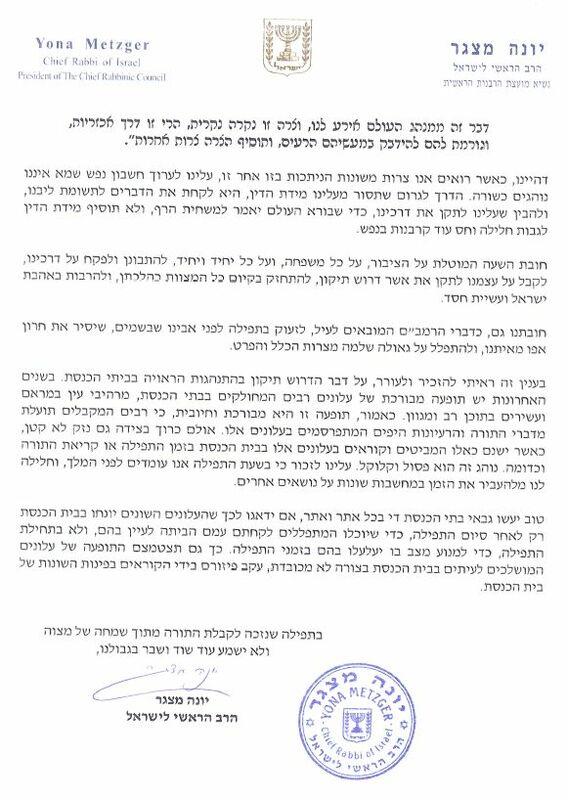 So, yes, the Haredi MKs do also have a plan regarding the draft. But their plan has already not worked for a long time, which is why the country is looking for an alternative. This post has been written in response to my post yesterday about the issue of moving the mechitza at the Kotel to divide the space more equally between men and women.. Thank you, Rafi, for offering me the opportunity to respond. Let me begin by stating that I appreciate someone being intellectually honest and saying, "I agree regarding the mechitza issue but not about the tallit issue." That is very mature and I hope you will join in any efforts made to change the policy regarding the mechitza. We do not have to agree about everything. I applaud the approach of agreeing to disagree but still respecting one another. We have to start thinking about am yisrael. I will start with number 2. When I was in the United States a few months ago, I met with one of the leaders of the Orthodox community. He explained that 20 years ago, Reform and Conservative Judaism were insignificant. Orthodoxy was alive and vibrant and Reform and Conservative held little clout and had no real future. That has changed. Why? He explained that it is 100% percent because of the stringencies and extremist policies which are taking hold in the Orthodox world. People who used to feel welcome and more at home in Orthodox circles no longer feel that way and they are looking for a religious home. This has become glaringly true in Israel where these movements did not try to make inroads – even when they were very strong. But now, they are on the rise in Israel and are creating serious challenges to the religious establishment. If we think about am yisrael for a moment, there is something we can do about it. If we find ways within halacha, I emphasize WITHIN HALACHA, to make all Jews feel comfortable, then on the issues where we cannot compromise they won't make a fuss. If we allow people to use any rabbi they want for a burial where there are no halachic issues at all, then they will respect the demands to kiddushin to be done according to halacha. If we work to make conversions more lenient, ACCORDING TO LEGITIMATE HALACHIC OPINIONS, then they won't demand that every one of their conversions be accepted. We are am yisrael and we have to find a way to work together even if we disagree and this can be done. The same with the tallit issue. Until 2001 there was no law against talitot at the Kotel. Were there masses of women flocking to the Kotel with a tallit? No! And that could make it easier to deal with some of the more stickier issues which may violate halacha. I believe that we can repeal the law regarding tallit and other practices on the women side and actually meet with these groups about a compromise to insure that halacha is kept at that site. Am I advocating that women should start wearing talitot? No. But Tosfot, the Rosh, and the Ran all said that women can wear them and make a bracha as quoted by the Rema before he suggests that they don't so why make an issue out of it? Let's embrace Jews and make them feel more comfortable and work together to make compromises which still conform to halacha. Which leads me to point #1. Why is there such a policy at the Kotel? We all know that the average graduate of Mir or Ponovezh could not care less about a woman putting on a tallit at the Kotel. So, who does it bother? Extremists. Let me begin with a story which a madricha from MMY wrote to me this week. She took her students to the Kotel on Friday night. The girls were bothered by the fact that they had no space and they could not hear anything from the men's side. So, to give the girls a good experience, she brought them back later, after the seuda, when women weren't even davening there and, on the women's side (not right next to the mechtitza) they had a kumzits. What was the result? Men threw chairs at them! Yes, threw chairs at them. This madricha does not have an "anti-Charedi" bone in her body so let's not turn this into a discussion about that. She and the girls were in shock. How can anyone think they have that type of control where they can begin throwing chairs at young women? The answer is, they have been given the feeling that they have control! Let's go back to Bet Shemesh for a moment. Grown men on a street verbally assaulting 8 year old girls? Yes, they were given a sense of control from the Mayor and the Haredi political leadership. Think about it for a moment. Israeli flags fly in Beitar and Bnei Brak. Why? Because the average chareidi, even if he is not a Zionist, knows that he lives in the State of Israel and it is normal for the government to put up flags around its Independence Day and they respect that. But, the Mayor chose not to fly flags near the extremist areas. I emphasize, NEAR their areas. I understand and respect not flying them in their neighborhoods. But not anywhere NEAR them? This gives them the sense of control. It makes it THEIR territory. And, if it is THEIR territory they can police how people act, including little girls. The same with the Kotel. Who made the demand to make tallitot forbidden at the Kotel? Extremists! The average chareidi does not care. Once that law passes and they have control, they then feel empowered to throw chairs at young, religious women who are innocently singing in a group on the women's side. And that is why the issue of the mechitza and tallit are linked. Think for a moment what will happen the first time they try to move the mechitza to take away space from the men's side. The average person, chareidi or not, would not flinch. But the extremists will riot. And no one wants a riot. So, they control the site. And they, through UTJ and Shas, control religious policy in the country. And that is what I hope to change and what Am Shalem hopes to change. Halacha? Yes. Chumros? No. Unity? Yes. Polarizing Judaism and distancing fellow Jews? No. So, I believe we should change the law. I don't think we should be asking women to start wearing talitot nor do I think women will start doing this en masse once the law is changed. I simply believe that the Torah world is alive, well, strong, and unthreatened and, therefore, we should seek the lenient path in halacha - IN HALACHA - to make more Jews feel welcome instead of pushing them away. I believe that is what the Ribbono Shel Olam wants from us at this point in time and I believe that this will save our future as a people. You want to disagree with me? That is your right. But make sure you prepare your answer for the Ribbono Shel Olam when he asks you why you didn't find ways to proactively embrace more Jews and create more unity. Have your answer prepared for when He asks why enforcing stringent opinions regarding bein adam lamakom was more important than following lenient, but acceptable halachic opinions while being strict bein adam l'chaveiro and saving Jews. You have an answer? Fantastic. If you don't, give it some thought. The time has come for us to have open and honest discussions about real issues without the venom and vitriol which has become all too common and serves no productive purpose. Robin Gibb of the Bee Gees died this week. He is the 2nd Bee gee to die, leaving just one of the 3 brothers. The Bee Gees were supporters of Israel, and in 1971 they even produced a song called "Israel". The Bee Gees never performed in Israel, but Robin Gibb performed solo in 2007. Here is the Bee Gees "Israel", and following that is a clip from the 2007 performance by Robin Gibb. One Day, in Jerusalem . . . I did not have time to do a roundup today of interesting links, but I would like to point out this one exchange of posts. The exchange began when a Hassidic woman, later revealed to be a baal teshuva Chabadnik (a point that is relevant to the content of the exchange), named Chaya who wrote a post for xoJane.com entitled "What Women's Media Needs To Know About Chassidic Women". Chaya goes on to describe how Chassidic women are not oppressed, despite common knowledge otherwise. Chaya describes the freedom, the pleasure, the choices she has open to her and concludes that the Chassidic woman is not oppressed. I thought Chaya's post was a beautiful description, even if not completely representative of all Chassidic women and even if not representative of every persons experiences, and even if perhaps a bit exaggerated in exuberance.. In response, Rabbi Fink wrote a post entitled "Dear Chaya" in which he tempers Chaya's post, describing where her descriptions fell short. Women are opressed and repressed. Most Chassidic women do not have the freedom of a Chabad woman, and definitely do not have the experiences of a baal teshva who has chosen such a lifestyle rather than having been born into it. There are problems, the community is not perfect, and progress on various issues must be made. While obviously Chaya's post has a far more positive nature and Rabbi Fink's post has a far more tempered tone, both are important. In today's day and age, everybody has a voice. Like it or not, freedom of speech is a reality, even in countries where there is officially no freedom of speech. Twitter and Facebook have even been used to overthrow governments in countries where such sites were blocked and officially inaccessible. That's just the way it is. A month ago, Rabbi Avi Zarki, a rav in north Tel Aviv and a popular mohel, made the news when he used his Twitter account to comment on the unusually small size of a baby's genitalia along with a recommendation of changing the procedure of circumcision. Rabbi Zarki is in the news once again, and again it is for his use of Twitter. Rabbi Zarki seems to be in a fight with Chief Rabbi Shlomo Amar. I don't know how it began, but according to the Maariv article on the matter, Rabbi Zarki turned to twitter after Rabbi Amar asked him to stop acting as the rabbi of north tel Aviv. He also threatened Zarki that unless he were to sign such a commitment, Rabbi Amar would work to get him removed from the list of rabbis approved to perform wedding services. Rabbi Zarki adds as well that Rabbi Amar has pressured Radio Kol B'Ramah to cancel his radio program. I obviously don't know all the details of this, but it seems the fight is because of his tweet last month about there no longer being a need for "preeya" (he claims to have developed a method of mila that renders preey to be redundant. he claims to have rabbinic approval, including from Rabbi Amar himself). Rabbi Amar called a committee to investigate and decide whether Rabbi Zarki is making changes to the traditional circumcision procedures. According to Rabbi Zarki's twitter updates, the committee was loaded with Rabbi Amar's men, people appointed by protexiaץ Despite that he claims he had a knockout punch for the committee when he pulled out rabbinic letters, including one from Rabbi Amar himself, saying that they had investigated his method and found it to be halachically acceptable. In response, Rabbi Zarki has turned to Twitter to vent his frustration. He posted numerous "tweets" on his twitter account in which he accuses Rabbi Amar of intimidation, being a liar, deceit and calls him all sorts of names. I guess it is understandable, considering the attack he has been under, for unclear reasons, but I must say it is very unbecoming. Not only has Twitter empowered the world with an unprecedented level of freedom and ability of speech,m giving a voice to people who had none, Twitter is also becoming the platform of rabbinic fighting. Rabbi Dov Lipman wrote an interesting, and important, op-ed in the Jerusalem Post about women at the Kotel. The piece is mostly focused on the inequality of how the space in front of the Kotel s divided up between the men and the women. The men have a very large area, probably about 80% of the space along the length of the wall, along with a large indoor section as well. Except when it is unusually crowded, men have plenty of space to spread out and to approach the Wall. On the women's side, on the other hand, the amount of space is very small, and there is not really an indoor section for those days where one needs protection from the extreme elements (e.g. heavy rain, hot and glaring sun, etc.). The women are crowded in a number of rows deep, and it is not easy either to spread out or for any individual woman to approach the Wall without waiting a long time for her turn. Anybody going to the Kotel has noticed the discrepancy and most have probably wondered how this came to be. I know I did. Rabbi Lipman suggests that the space be divided more equally between the mens side and the womens side. the mechitza should be a mobile mechitza, generally placed in or near the middle but moveable for those occasions where there is unusual crowding on one of the sides. My wife and I chose to bring our daughter to the Kotel, the Western Wall, on the night she turned 12. We figured what better way to begin her life as a bat mitzva than praying at the site where our ancient Temple stood. I prepared myself for inspiration as I watched her approach the wall with her mother – but instead experienced great indignation. The men’s side of the partition consisted of a single line of men along the entire length of the wall. The women’s side, which is far less than half the size of the men’s side, was stuffed with women six rows deep. My wife could only bring my daughter up to the wall after waiting a long time and, even then, had to push her way through. I watched this happen and could not believe the disgrace to my daughter, to my wife, and to all women. Then, as I continued to observe my daughter praying, I could not avoid noticing how women had to wait and push to get close to the wall while on the men’s side, they could easily and immediately walk up to the wall. The time has come for this situation to change! A brief overview of what the classic Torah sources say about women demands that the situation at the Kotel must change. Complete equality! Not a secondary being who should be treated differently from the men in terms of access to the wall and feeling that closeness to God. Our tradition actually goes even beyond demanding equality and puts women on a pedestal. The Talmud teaches that the Jews were redeemed from slavery in Egypt due to the merit of Jewish women, and that the women did not worship the golden calf or believe the negative report of the spies about Israel. Our salvation in the Hanukka and Purim stories came because our women rose to the occasion. According to our tradition, women have “binah yeteira” – an ability to understand and comprehend which has repeatedly helped save the Jewish people throughout history. How, exactly, does making a woman go through such effort and experience such discomfort while praying at the Kotel fit the command to honor our wives more than ourselves? The conditions for women at the Kotel are disturbing for an additional reason. The Talmud (Tractate Brachot 31a) teaches that we learn the most basic laws of prayer from... a woman! It is absurd that the men praying with such comfort at the wall, are praying based on the example of a woman, while the women themselves must struggle to achieve meaningful prayer on their side of the partition. A reasonable solution to this issue starts with changing the location of the partition to the middle of the Kotel plaza. That is equality! That is respect! The partition should be portable so that it can be shifted based on the needs of either side. This idea is simple, practical and fair. I must take this issue of women at the wall one step further. I completely agree with the policy of observing halacha, traditional Jewish law, at the Kotel. This is the place where the Temple stood and total reverence to the traditional understanding of God’s will should be observed in such a holy place. That is why there must be a partition between the women and men. However, the guidelines and policies should not go beyond basic laws and cross into the realm of stringencies and customs. Women should have the freedom to do that which enables them to connect best to God if it conforms to halacha. Therefore, since according to Jewish law there is nothing wrong with a woman wearing a tallit, why are women not permitted to wear a tallit at the Kotel? It is correct that traditionally women have not worn them, but a woman violates no Jewish law when she does. Creating legislation forbidding women to wear a tallit simply because it rubs certain individuals the wrong way is not valid. Everyone should focus on their own prayers and not be concerned with how others connect to God. And, if men are the ones complaining, I must ask: Why are they looking at the women’s side of the partition anyway? The time has come for us to recognize that the State of Israel is a blessing from God which can be a unifying force for the Jewish people instead of a polarizing force. It should be a vehicle for embracing more people to connect to their Judaism instead of pushing them away from it. What I witnessed at the Kotel that night, and hearing about women being arrested for wearing a tallit while praying there, creates polarization and distancing without any Torah or rabbinic law having been transgressed. I hope all women view this as a call to action. If Jewish women have been praised throughout history for saving the day, perhaps it is time for women to end this madness as well. Women should rise up and demand that while accepting halacha at the Kotel is important, the degradation of women will no longer be tolerated. Let us begin correcting this lack of respect by erecting a moveable partition which starts every day with half the wall for men and half the wall for women. We now find ourselves in the days during which we commemorate the miraculous return of the Kotel to our hands. There is, no doubt, a strong religious connotation to these celebrations and these remind us that the Kotel is a holy place where everyone can agree that halacha should be observed. But that can be accomplished without the current policies toward women. Our holy women demand better treatment than this. I want my next daughter to have no problem approaching that special wall on her bat mitzva night. I agree 100% with Rabbi Lipman on this issue. There is no reason for the women to be crowded in like that. The space should be divided up more equally, and allowing for a flexible mechitza makes a lot of sense. I dislike the inclusion of the women wearing tallit issue as part of the article. I agree that people should mind their own business, and if it is not going against halacha, and technically women are allowed to wear tzitzit even though today it is uncommon and perhaps only done today as a sign of womens lib or some form of progressive Judaism, the issue should be ignored when it happens rather than turned into a fight. In a discussion (on Facebook) about that very point, Rabbi Lipman insists the issues are connected - he says they are both the result of extremists being in control of the Kotel area, and really of Judaism in general. (I hope I am presenting his position accurately - Rabbi Lipman is welcome, as always, to write a guest post here in response to clarify his position or to respond to my thoughts). The extremists stick their nose into what other people do, they stop the women from wearing tallit at the Kotel on the womens side of the mechitza turning the issue into a big fight where people from both sides often get arrested, and they are also responsible for the crowding of the women into a small section. I don't know the history of how the plaza was divided up. I don't know how the women got such a small section compared to the expanse of the mens section. Perhaps someone can fill me in with the history and background of this. I do not think it has anything to do with extremists controlling the area and determining that women should only have a small amount of space. For whatever reason, originally it was divided up unequally and has remained so until this day. 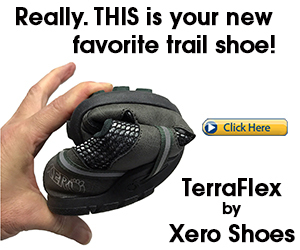 Perhaps nobody has tried hard enough to get it redesigned and more equally distributed. not everything is an issue of extremism. Yes, it is unfair and unequal. yes there is a need to rectify the situation. No, not everything needs to be turned into a big fight of survival and existence. Here is a tremendous story of people rising up over politics. it is both the story of how sport transcends politics, and, perhaps more so, about humanity transcending politics. An Israeli mountain climber, Nadav, was about to finish his climb of Mount Everest As a matter of fact, he was about to set a new record as the oungest Israeli ever to reach the top of Mount Everest. Nadav had trained for two years to reach this point. 250 meters away from the top of the mountain, Nadav sees a fellow climber, someone from Turkey, sprawled on the icy ridges of the mountain. Instead of finishing the climb - just 250 meters to go! - Nadav stopped and picked up Aydin, carrying him for 8 hours back down to the camp at a lower altitude where he would be nursed back to health. Nadav did not just give up the record, and the personal satisfaction of completing such a major climb after having come so close. Nadav may also lose his hand because of his selfless heroics. The freezing cold strong winds tore into him and Aydin, and he had to remove his gloves to be able to maneuver. His hand might need to be amputated. But he saved a life. Nadav Ben-Yehuda was moving fast on the bitterly cold night of May 19, skillfully maneuvering through the final 1,000 meters from Mount Everest’s Camp IV to its summit – the highest in the world at an altitude of 8,848 meters. He had trained for two years prior, climbing all over the world since he finished his army service, and he chose to do the final stretch of Everest – the summit climb – a day after the rest of his group to avoid pedestrian traffic jams, despite a less than desirable weather forecast and a dangerous extra day spent in Camp IV without a sleeping bag. “When we started the climb I was supposed to be fully exhausted but I climbed really fast,” Ben-Yehuda, 24, told The Jerusalem Post, over the phone from Kathmandu, Nepal, on Tuesday afternoon. He continued trudging, with his Sherpa guide trailing behind him, until he suddenly came to a stop some 250 m. away from the summit. Shocked, he saw the body of his friend from the base camp, Aydin Irmak, 46, sprawled lifelessly on the icy ridges. “When we saw my friend Aydin there was no question,” Ben-Yehuda said, noting that on his way to Irmak he had already passed two dead bodies clipped to the climbing rope. Knowing that they were going to die, these men had purposely fastened their bodies to the ropes affixed to the snow covered ridges, freezing into a permanent slumber. In the end, four people died on that icy Everest night – but Ben-Yehuda and Irmak were not going to be among the departed. “Spring 2012 will be remembered as the deadliest season of Everest ever,” Ben-Yehuda said. Grayson Schaffer, an editor at Outside Magazine who is stationed at base camp, wrote on his magazine’s website that the mood at the camp since the weekend “has been overridingly gloomy since the news of the mishaps first began trickling down the mountain,” when four additional climbers died on Saturday. Had he chosen to continue climbing, Ben-Yehuda would have been the youngest Israeli ever to make it to Everest’s summit. “It really changed my plans,” he said. Lifting Irmak over his shoulders, Ben-Yehuda carried his Turkish-New Yorker friend alongside his Sherpa guide for about eight hours back down to Camp IV – without gloves, as they made the rescue process too challenging – and without oxygen, as his mask had already broken. During the breathless march downward, the group passed by a Malaysian climber, also prostrate and semi-conscious. Unable to carry a second person, Ben-Yehuda said he luckily soon crossed paths with a British climbing team, who were able to bring the Malaysian man oxygen and revitalize him. The negative 40-degree Celsius temperatures left both men with severe burns all over their faces, and Ben-Yehuda’s ungloved hand is blackened to a crisp, some of which may need to be amputated, he explained. But eventually, the men made it back to Camp IV, where a helicopter came to their rescue – allowing both of them to live. To Ben-Yehuda, the choice to forgo his summit climb and save his new friend was simple, a no-brainer. Ben-Yehuda was speaking on the phone from a dinner hosted by the Israeli ambassador to Nepal, Hanan Goder-Goldberger, at a new Kathmandu blind restaurant called Dining in the Dark, which is a partnership between the Israeli embassy and the Nepal Association of the Blind. Calling Ben-Yehuda a “hero,” Goder-Goldberger said he was proud that despite all the physical training that the young man had performed to make it to the summit, he made the noble decision and turned around, to save a life. Ben-Yehuda handed over the phone to Irmak, also at the dinner, who described to the Post his full-body exhaustion and the pain he was feeling waiting for his fingers to heal. Irmak, too, had lost his gloves in the 200-km. per hour winds. The first problem for Irmak occurred when his Sherpa guide showed up late, causing him to trail two hours behind the rest of the group that had left on the evening of May 18. “Unfortunately, also the mask of my oxygen broke,” he said. At the recommendation of the Sherpa guide, Irmak took his mask as well as three or four oxygen tanks of about 5 kg. each and successfully completed the 11-hour walk to the summit. By the time he arrived there, members of his group that had departed earlier were already leaving the summit to return to Camp IV. Once he found his window of opportunity to actually stand on the summit, Irmak stayed there for about five or six minutes and then began his treacherous descent. “I started walking and walking and walking,” he said. “I don’t know how long I walked. And it of course was dark and I was out of oxygen. Then I needed to stop. I don’t remember. The only think I remember is Nadav’s voice – ‘Aydin, Aydin, are you there brother? Can you move your legs?’” “When I woke up there were four dead bodies around me,” he continued. In an effort to express his gratitude, Irmak tried to give his Everest summit certification to Ben-Yehuda, but the authorities would not allow such a transfer, he explained. Since they met at base camp, the two men “had a brother relationship,” according to Irmak. The two brothers could not be bothered with the growing tensions between Israel and Turkey, and instead, continue to think of each other as family and friends. “I don’t know what the hell is going on between the two countries. I don’t care about that. I talked to his family today and I told them you have another family in Turkey and America,” Irmak said. While the authorities initially granted him a permit to take the bike up to 7,900 m., once he arrived at base camp they changed their minds and “arrested” his bike. This was around the time he met Ben- Yehuda, who was the first person to arrive at the base camp after the Turkish cyclist. Ben-Yehuda too, who actually won a stair-climbing competition in Ramat Aviv two months ago, is determined to continue with his climbing. While he would like to return to Mount Everest at some point, he said that this mountain was never specifically his lifelong dream, like it is to many other climbers. For now, he will keep visiting the hospital in Nepal every morning for check-ups on his hand until he returns home, where he said he will definitely stay in touch with Irmak. “If you get me a passport to Pakistan I would go to K2,” he added, laughing. Did King David Rule An Empire or A Village?